The existence of 'Buddhist astrology' itself is a curious thing because, according to both vinaya texts and several sūtras, it really should not exist. 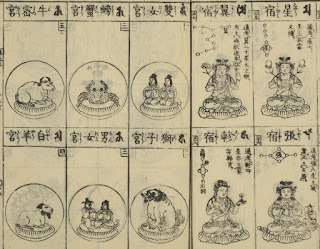 Nevertheless, we can point to a few major specimens across the centuries in which astrology is unapologetically explained: the Śārdūlakarṇāvadāna (second or third century CE), Amoghavajra's Xiuyao jing 宿曜經 (eighth century) and the Kālacakra Tantra (eleventh century). 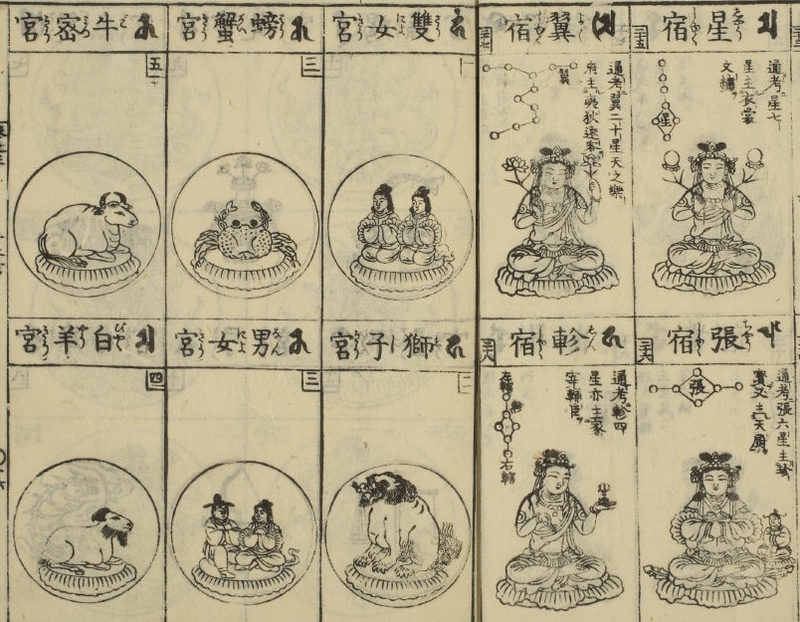 Many Buddhist authors indeed took an interest in astrology and weaved it into Buddhist literature, creating what can be called a 'Buddhist astrology'. Although we can speculate about how extensive it was in India – and I personally think it was quite significant from the eighth century onward – much of it was transmitted and preserved in East Asia and Tibet where it evolved and flourished in the new environments. This helps to explain why the encyclopedic explanation of nakṣatra astrology in the Śārdūlakarṇāvadāna is given by the layman Triśaṅku and not the Buddha. Although we might get the sense that the author(s) of this work felt astrology was indeed valid, they were still aware of the prevailing sentiments against it at the time. This work would have been written shortly before Hellenistic astrology was being introduced and spread around India. The representative work in this respect is the Yavanajātaka – the 'jātaka of the Greeks'. The status of astrologers was elevated in the following centuries resulting in well-known figures like Varāhamihira in the sixth century. The Buddhists were no doubt exposed to these influences and Mahāyāna literature like the Avataṃsaka-sūtra suggests the bodhisattva might study calendrical science and astrology for the benefit of beings, which indicates at least some had reconsidered the Buddha's prohibition on such matters. By the early eighth century a model of hemerology (selection of auspicious days for rites) based on a hybrid of Hellenistic and Indian elements had become essential to the proper execution of maṇḍala-s and initiations within the tantric community. It is of course most unlikely the Buddha actually said such things given that the Pāḷi canon was formulated long after his death (and moreover, the extant version is arguably from even later), but the Buddhist literature presents him in this light and incidentally also records the ongoing introduction of Babylonian astrology into India, which occurred through intermediaries such as the Achaemenids and Seleucids. The early Buddhist community was witness to this and the architects of the literary tradition found it simply inappropriate for the śramaṇa to practice. This has led some to suggest that although it was rejected as inappropriate, its validity was not – in other words, you could believe in astrology, but you were not supposed to practice it. This is a simplistic conclusion and ignores another specimen of extant literature which actually expresses skepticism about the effectiveness of astrology and refutes astrological determinism: the Saddharmasmṛtyupasthāna-sūtra (正法念處經; T 721). The Chinese translation was done by Gautama Prajñāruci between 538–541. In it we find long skeptical discussions of astrology and creative attempts to turn the monk from astrology to orthodox Buddhist practice. This suggests that in fact many bhikṣus were neglecting more orthodox practice in favor of astrology. This is especially noteworthy because a belief in the effectiveness of astrology requires, to some extent, assent to the idea of astrological determinism, i.e., that one's condition, fate and personality are primarily and directly determined by the influences of stars rather than individual action. This effectively undermines the concept of past karma determining one's condition, which would have been objectionable to Buddhists of the scholastic schools. It also brings to mind similar objections to astrology on the part of Christians who saw it as an issue with respect to free will. The text addresses how astrology is incompatible with karma as follows. Again, this being a Buddhist text written for bhikṣus, it indicates many such individuals had already adopted a view of astrological determinism and the author of this work felt this was wrong and had to be refuted. However, as the proliferation of astrology in Buddhist culture would suggest, such arguments did not successfully eliminate the heresy. Incidentally, we might note that the vinaya codes in theory could address the practice of astrology, and perhaps they were used in some monasteries in India to contain the heresy, but I am unaware of any evidence to suggest this happened. This is saying that a person's ill health and unease are a result of not only karma, but being born under unfavorable astrological circumstances. Another way to interpret this is that being born under such circumstances was a result of past negative karma. Just as someone born with a deformity attributed to past negative karma might be 'locked into' that state for life, so too is the individual stuck with their bad stars. This sort of understanding was arguably only available in a Mantrayāna context which could freely accommodate otherwise foreign and heterodox ideas into the doctrinal fabric of a new Buddhadharma. This belief in astrological determinism indeed should challenge our understandings of what Buddhists believed or ought to have believed about karma. The various theories of karma discussed at length in the Abhidharmakośa, for example, might have been argued and upheld by a minority of scholastic monks, but alternative views – which were apparently heretical to some Buddhist authors – still withstood the test of time and became accepted by an evidently significant number of elite Buddhist clerics who wrote the relevant canonical texts we have today. I have never encountered a discussion of Buddhist philosophy in modern scholarship (be it western or Asian) which takes into account the Buddhist concept of astrological determinism. It is simply not recognized in modern scholarship as even existing, even though it was quite influential in the development of Tantric Buddhism especially. This is perhaps because there was no representative school in India, or China or Tibet for that matter, which could be understood as a coherent community with established doctrines and arguments arguing for the truth of astrology. There was of course the Sukuyō-dō 宿曜道 lineage in Japan from the tenth to the fourteenth century, but their history and existence is seldom known today, let alone discussed even in modern Japanese scholarship. Their tradition, however, was far more practical than theoretical. It is this gap in modern scholarship that my ongoing research addresses. There is much more to be considered and in due time our discussions here will go into more detail as time permits. 1 Johannes Bronkhorst, Buddhism in the Shadow of Brahmanism Handbook of Oriental Studies (Leiden: Brill, 2011), 120. 2 David Pingree, From Astral Omens to Astrology From Babylon to Bīkāner (Rome: Ist. Italiano per l'Africa e l'Oriente, 1997), 32–33. 3 T 721, 17: 290b12–19. 4 T 721, 17: 290b1– 8. 5 Read mian 眠 as mian 綿. 6 This refers to a convergence between the moon and an unfavorable nakṣatra. 7 T 1100, 20: 448b11–13. The ancient world did not draw a strong distinction between astronomy, calendrical calculation, and astrology. They were all viewed as different aspects of the same discipline. Calendrical calculations were needed to set the date of the new year and the date for recitation of monastic vows. Astrology was and is used mostly to pick the most auspicious date for an event, also as an adjunct to medical diagnosis. That's not entirely true. The Chinese and Indian traditions both recognized that mathematical methods for calculating and predicting astral phenomena could be treated separately from what we would call astrology. Although that distinction was not necessarily as pronounced as it is today, it still was there and there's a tendency to assume that such a distinction was non-existent. My guess would be that the adoption of astrology by Buddhists had a lot to do with the Brahmanisation of Indian culture. Contact with and exchange of ideas with Brahmins (whose homeland was much closer to Achaemenids than the Sramana's), seems to have been a constant. Though other vectors for transmission of Iranian culture into India also seem to exist (small scale migrations into the Gange Valley). There are also apparent proscriptions against the use of Sanskrit in the Pāli suttas, and yet by the Gupta Era everyone in North India was writing in Pānian Sanskrit. This included Buddhists who translated many (if not all) of their texts into Sanskrit and composed new texts in it (see recent work by Karashima). The prohibitions against astrology aren't datable, so could have been added at any time until the canon was closed - around the beginning of the common era (which also makes me wonder if the same lists are found in the Chinese Āgama texts). Does the fact that the prohobitions occur in the section which is repeated verbatim in all of the first 13 Suttas of the Dīghanikāya point to any conclusion? Of course the fact that the Vinaya or even a sutta explicitly bans a practice is evidence that Buddhist monks were doing exactly that thing. Clearly monks were engaged in divination - the ban calls it "wrong livelihood". Perhaps the problem was not the divination per se, but the getting paid for it? Nevertheless, by the time of Varāhamihira those sentiments had changed and astrologers were, it seems, much more respected. Perhaps that had something to do with the demonstrated utility of mathematical astronomy of the Hellenistic variety (just speculating). A śramaṇa must not observe above [the sky], make calendrical calculations, nor calculate the sun and moon. Nothing is to be known of waxing and waning, eclipses, meteorites, strange occurrences, landslides, earthquakes and annual winds and rains. As to the repeated proscriptions of the Dīghanikāya, I can't draw any immediate conclusions. I get the sense, as Bronkhorst also concludes, that the early Buddhist community was quite opposed to astrology. I think it was just generally seen as inappropriate for a śramaṇa to practice, but moreover it challenges various theories of karma – not unlike how Christian thinkers objected to it on the basis that it challenges free will. Astrological determinism basically means there is a fate and you are subject to it. Although a lot of Buddhists inevitably equate karma = fate without thinking in terms of the traditional scholastic theories, astrology was formulated in a polytheistic environment (both in Mesopotamia and the Hellenistic world) and thus fate in some way is often considered connected to gods, so obviously it isn't up to individuals. If things are fated and these developments “signaled” by the stars, then your destiny is out of your hands. Amoghavajra would have sidestepped this issue by perhaps suggesting your fate is fixed in this life due to past life karma, but you have the option of getting a better set of stars the next round through Buddhist practice. Eventually a book will be written on this subject, but in the meanwhile I have a paper I hope to get published next year. There's another in the editing process about the vinaya and the astrology in China. My dissertation will be hopefully done in 2018.